Ascend Education Centre is committed to having a comprehensive, fair, reasonable and transparent refund policy on the managing and processing of refunds for students under various conditions for any payment made which reflects our PRIDE values. ways of resolving disputes (1.9) between the Student and Centre over refunds. The Student will be informed in writing of alternative study arrangements (if any), and also be entitled to a refund of the entire Course and Miscellaneous Fees already paid should the Student decide to withdraw, within seven (7) working days of the above notice. The Course Application Fee is non-refundable in the case of the Student’s Pass application being rejected by Immigration and Checkpoints Authority (ICA). The following payment is non-refundable: Course Application Fee. Ascend Education Centre offers students a cooling-off period of seven (7) working days after the date that the Contract has been signed by both parties. Students can submit their written notice of withdrawal to Ascend Education Centre and will be refunded the highest percentage stated in the above REFUND TABLE in Schedule D of the Standard PEI-Student Contract Version 3.1 (95%). Students who withdraw during the cooling off period will receive their refund within seven (7) working days from receipt of the completed and signed Request for Refund Form. Students must adhere to the guidelines issued by the Centre. The withdrawal and refund policy stated in the Standard PEI-Student Contract Version 3.1 applies, should any student be expelled from the course by the Centre due to misconduct, inappropriate behavior or failure (in the case of international student pass holders) to attend classes for seven consecutive ways without informing the Centre. The Centre reserves the right to terminate the enrolment of any student if that student continues to misbehave despite two written warnings issued by the Centre. On the issuance of a second letter of warning and no improvement in the student’s behavior the Centre, through its Board of Management, reserves the right to terminate the enrolment of the student. The decision of the Board of Management is final. The Centre will as soon as practicable and no later than 7 (seven) working days after terminating the student’s enrolment at the Centre refund the student if any amounts are due based on the Standard PEI-Student Contract. The standard refund policy for withdrawal for any other reasons shall apply for transfers and withdrawals unless otherwise agreed by the Centre’s Management Team. The Management Team will consider individual student requests for transfer or withdrawal outside of the refund window (more than seven days after the course commencement date or after the cooling off period, whichever is later) where the student has submitted the Request for a Refund Form plus supporting documentation to support the request from a student. If approval for a refund is granted by the Management Team in such cases, the unconsumed portion of the students’ course fees are refunded. Students whose Request for a Refund is approved by the Centre Management Team will be refunded the unconsumed amount of course fees no later than 7 (seven) working days upon receipt of the student’s completed and signed Request for a Refund plus any supporting documentation. Overpayment of course fees can occur when fees are paid through telegraphic / bank transfers due to overprovision of bank charges or to exchange rate differential. Any overpayment of fees exceeding SGD 5 will be refunded. If the Student is eligible for a refund, the Student will be notified and must submit the Request Refund Form duly completed and signed. Students whose Request for a Refund is approved by the Centre Management Team will be refunded the overpaid amount no later than 7 (seven) working days upon receipt of the student’s completed and signed Request for a Refund. 1. Refunds in all cases shall be processed within 7 (seven) working days if any amounts are due based on the Standard PEI-Student Contract Version 3.1 or due to Ascend Education Centre’s refund policy. 3. If the student wishes a third-party to collect or receive the payment on their behalf, the student is required to complete Section C of the Request for Refund Form authorizing the refund to be released to the third party. 4. 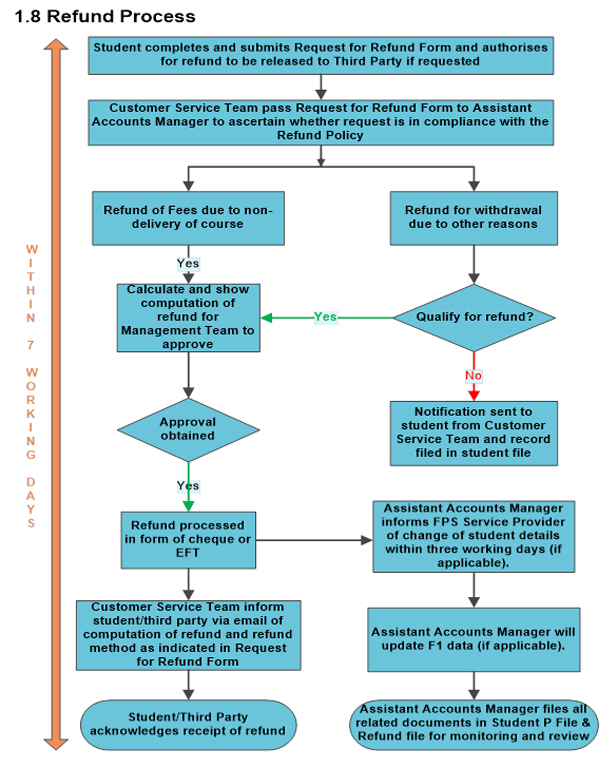 Once the refund is ready to be released, the relevant party (student/third-party) will be notified through email together with the calculation of the refund as per Section D of the Request for Refund Form based on Standard PEI-Student Contract Version 3.1 (for CPE registered courses) or Ascend’s Refund Policy. 5. If the student/third party is present in Singapore and can collect the refund through cheque at the Centre, the student/third party must sign a payment voucher to acknowledge receipt of the refund. 6. If the student/third party is refunded through Electronic Funds Transfer, they will be emailed confirmation that the funds have been released. Students/third party are encouraged to acknowledge receipt of the funds once they receive confirmation that the funds have been credited into their account.